G.N.W. Bryant created what has become two of the most sought after bitters containers in the bottle collecting community. These bottles were manufactured in the east and it is believed distributed exclusively in the west during the years 1857 – 1861. The firm of William Newell & Co, an early San Francisco wholesale liquor house, were the agents for Bryant’s Stomach Bitters on the Pacific Coast. 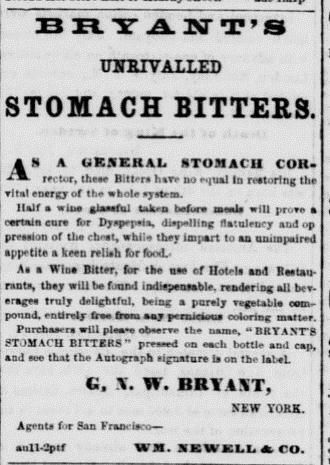 In his advertisements Bryant claimed his bitters were an unrivaled stomach corrector and had no equal at restoring the vital energy of the entire system. He recommended a half a glass of his wine bitters before meals to impart a keen relish for food. Bryant probably only produced these bottles for no more than a few years and by 1870 all mention of Bryant ends. The first advertisement for the Bryant's bitters, that I have found, in a 1859 Sacramento newspaper claims that the bitters has the name "pressed on each bottle and cap, and see that the Autograph signature is on the label". I believe this is the first of the embossed Bryant's Stomach Bitters bottles known in the hobby as "The Cone". The Bryant's cone is an extremely rare bottle with possibly only three or four known whole undamaged examples in private collections. 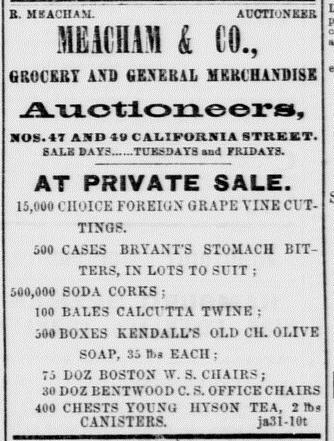 In February of 1860 another Sacramento newspaper has an advertisement listed by Meacham and Company for a private auction of 500 cases of Bryant's Stomach Bitters in lots to suit. Five Hundred cases of Bryant's Stomach Bitters! 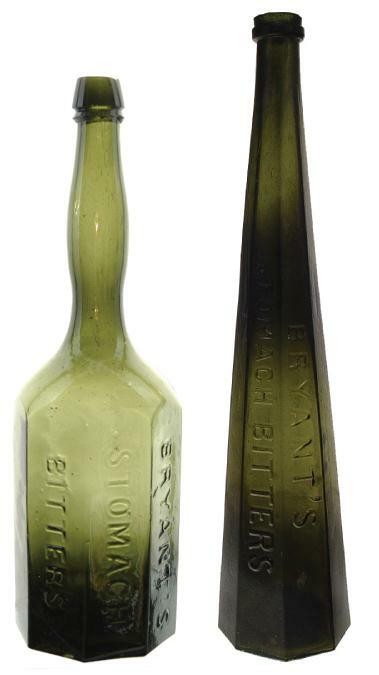 Could these be the Bryant's "Cone" bottles that were tall, narrow and generally a poor design for a bottle that was used daily? Where the heck did these 500 cases of bottles go???? The summer of 1861 in The Sacramento Daily Union has an advertisement for the Bryant's Stomach Bitters with Benjamin Brady, located on California Street, as the agent for the Bryant's product. The advertisement does not mention that the bottle is embossed but does call the product "The Cheapest and Best" and is liberally discounted to the trade. 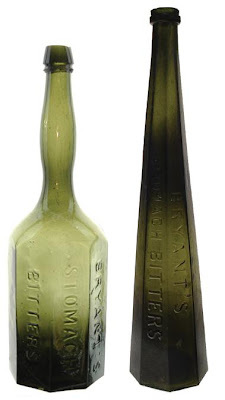 Could this be the Bryant's Lady's Leg bitters that is believed to be the second of the Bryant's embossed bottles? After this 1861 advertisement I can't seem to find any other advertisements for the Bryant's bitters product. One thing is certain, more research needs to be done on these rare and interesting bitters products. Perhaps the latest newspaper ad actually answers the question as to where those 500 cases went.